Lifeline® Iliac Artery Endothelial cells, when grown in Lifeline® VascuLife ® culture medium, provide a low-serum culture ideal for the study of atherosclerosis and other cardiovascular diseases, general vascular biology research, wound healing and cell migration studies. Human Iliac Artery Endothelial Cells are isolated in a specialized endothelial cell medium called VascuLife® EnGS Medium to ensure that they remain unexposed to recombinant human VEGF. This specialized medium provides a low-serum (2%) environment with or without VEGF that results in optimal endothelial cell growth over a period of at least 15 population doublings at rates equal to or greater than serum-supplemented medium. Lifeline® iliac artery endothelial cells are plated and expanded in culture vessels twice before being harvested for cryopreservation to ensure the highest viability, purity, and plating efficiency. 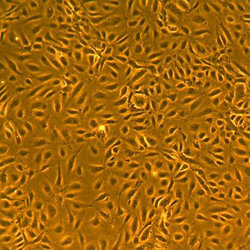 These cells are not exposed to antimicrobials or phenol red when cultured in VascuLife® medium. Specific Staining: von Willebrand factor positive. Smooth muscle α-actin negative.